Singapore v Argentina Football Friendly: You Know The Result..
You better put your booties on, cuz it’s COLD (humid) OUTSIDE!! Groundhog Day-esque is how I would describe the Singapore v Argentina soccer friendly last night. Minute after minute, it seemed the quite ordinary looking Argentina side adopted the same attacking tactics against a predictably nondescript Singapore team. More of that in a bit. 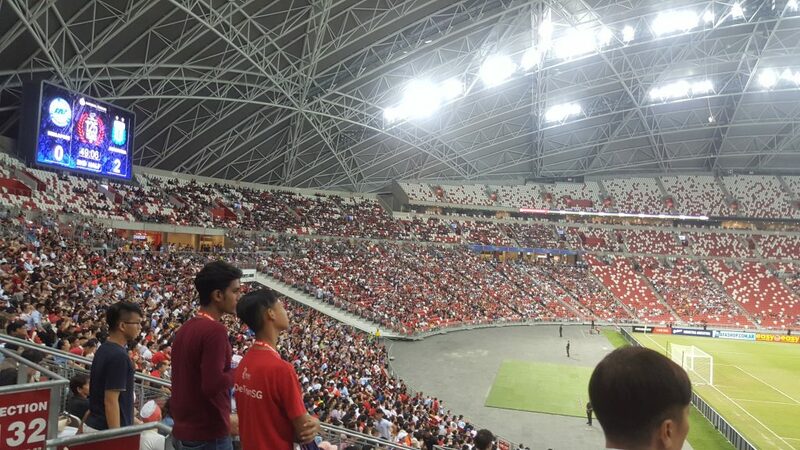 Lionel Messi was heralded as headline act in the roll up to this auspicious (and lets face it, weirdly A-List for Singapore) friendly. “Messi, Aguero and Argentina are heading to the Singapore Sports Hub” screamed FourFourTwo soccer website back in April. “Confirmed – Lionel Messi and Argentina stars to play in Singapore” warbled the StraitsTimes in the same month. Confirmed turned to conned in some fans’ eyes. Around a week before kick-off it was confirmed he wouldn’t be playing due to, ahem, preparing for a wedding. Cough. Splutter. Maybe it was known before then, maybe it wasn’t. My cynical soul says a bunch of suits met and said it wouldn’t be good for business if it was announced earlier than that. And then Aguero, Higuain, and Otamendi (the next BIG names on the team) didn’t show either. It’s a little sad when foreign club support trumps country support but personality and fame trumps loyalty to other…things…these days. Why am I saying trump a lot…? The game was a little lacklustre. Yeah, it ended 6-0 but in the first half the repeat ad nauseum attacking style of Argentina (spray it to flanks and look for holes) didn’t inspire me to crack open the old size 10s and try to re-create what I was seeing. Sure there was flare on show but Di Maria flattered to deceive on the right flank and made himself look decidedly average. Again. Singapore? Apart from the diminutive number 27 for Singapore, skinning an astonished Argentinian on the right flank once there was nothing to report. Here’s a sequence of attacks from the first half to the tune of Groundhog Day. Because I can. The goals they scored in first half were all inside the box finishes after consistent and constant probing. Singapore played a rarely seen 10-0-0 formation. Argentina resorted to the even more lesser spotted 2-3-5. Lovely. Take a look at the highlights. The National Stadium is a decent venue for these games but the pitch, as always, looked terrible. Tiger beers at 12$ for a half-pint size? Check and checkmate.